In our new series, The Science of Beauty, we're going to do a bit more research into the making of a great beauty product. While we've talked about the textures, scents, and efficacy of our favorite formulas in our Reviewed series, this one is meant to feed the other side of the brain—the side we perhaps haven't tapped into since chemistry class. We'll talk science, experiments, and the ingredients that make each product work with experts in each specific field. Then we'll check back in with our favorite hair and makeup artists to get a breakdown on how to best use the products once they're out of the lab and back in our bathrooms. We dove deep into the technology behind volumizing hair products, learned about the history and chemistry behind antiperspirant, and read up on Accutane. Now, we're talking keratin treatments. The hours-long, in-salon remedy works to de-frizz and de-puff—I've even had it done myself in years past—but how does it work? We talked to the team at Keratin Complex for answers. Keratin is a fibrous protein found naturally in the hair that acts as a protective shield against humidity, the primary cause of frizz. Over time, the hair loses keratin from exposure to the sun, environment, styling, and chemical services—causing porous spots to develop (much like potholes in a road). "Keratin in [and of] itself works with the porosity of the hair. Most frizz, [damage] and tangled hair is due to overly porous hair," says Abraham Sprinkle, a Keratin Complex International creative team member. "Keratin treatments fill in [the gaps where keratin has been depleted], so humidity is combated and hair is left with a healthier appearance. Think of it in the same way spackle deals with nail holes in sheetrock: The surface is left smooth." 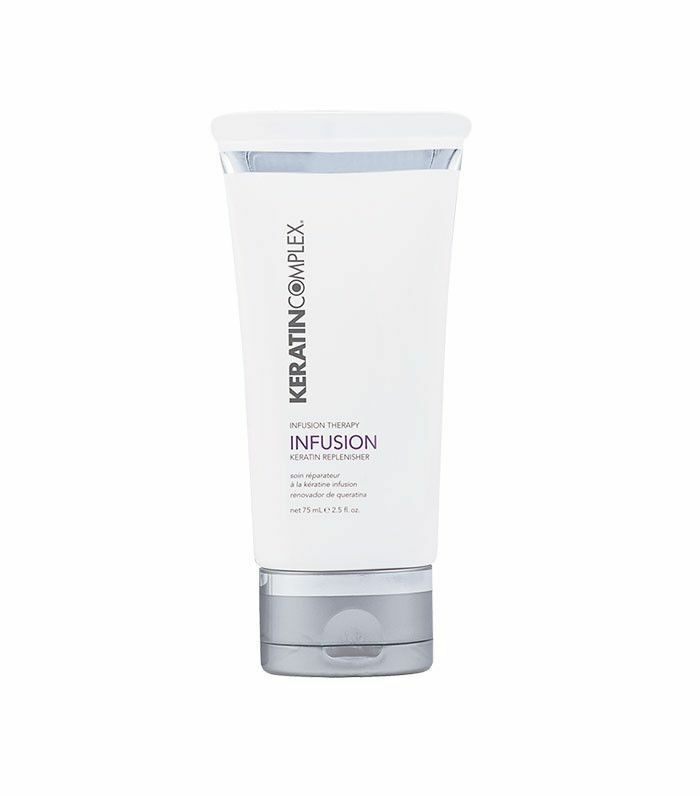 Performed in-salon by a professional stylist, this powerful treatment replenishes the hair with high concentrations of keratin that penetrate throughout the hair structure and are sealed within the cortex to repair the damage. "This locks out humidity, repairs damage and breakage, and rebuilds strength to make smoother, shinier and healthier-looking hair, improving manageability and significantly reducing styling time," Sprinkle explains. "Unlike straightening treatments (which can break protein bonds to reform hair structure into a permanently straight shape), Keratin Complex treatments won't break the bonds of your hair—instead, reducing frizz and restoring health to provide the straightening, smoothing effect without permanently changing the structure. This allows versatility to style wavy or straight as desired." 1. The pre-treatment removes surface buildup and prepares the cuticle, lifting its overlapping layers to allow the treatment to penetrate the hair. A clarifying shampoo is emulsified on damp hair twice before all Keratin Complex treatments. The alkaline pH properly activates the cuticle to best prepare the hair for a smoothing treatment. 2. During application, the keratin treatment penetrates into the hair's cuticle. Hydrolyzed keratin strengthens keratin bonds from within, helps repair damage, and smooths the hair shaft. 3. Keratin Complex treatments are applied with a brush and bowl application, similar to applying color. It is important not to oversaturate the hair, so a fine-tooth comb is also used to distribute the treatment. The keratin is driven into the activated cuticle, targeting the damaged areas. The application takes between 10 to 15 minutes and does not create any sensation on the scalp. 4. The hair shape is further adjusted with the assistance of heat—first with a blow-dryer and finally with a flatiron, sealing in the treatment to create a humidity-resistant finish and smooth silky strands. Though Keratin Complex treatments do not damage the hair, a flatiron at a very high temperature can. Always use a professional titanium flatiron and professional judgment when selecting the flatiron temperature. Start at the lowest recommended temperature and increase only if necessary. Each treatment costs from $300 to $350, and you should expect to spend two to three hours in the salon. Keratin treatments last up to 5 months, depending on the treatment chosen. Longevity of the treatment also depends on the client’s at-home maintenance regimen. It is recommended to always shampoo with a sodium chloride-free shampoo at home for optimal results. Next up, read about the fascinating science behind love at first sight.